11/20/2007 - ROYAL AIR FORCE FAIRFORD, United Kingdom (AFPN) -- When the Space Shuttle Atlantis, mission number STS-122, launches on Dec. 6, a world will stand watching. While it takes a massive crew to get the shuttle off the ground, there will be hundreds more waiting after the blast off. They are ground crew members of the Space Shuttle Transatlantic abort landing sites, one of NASA's "just in case" options if anything should go wrong with a launch. RAF Fairford is one of nine sites around the world. If a launch needs to be recalled in first four minutes after a launch, a return-to-landing site is ordered. The TAL mode is an option when the last RTLS opportunity has passed, but before the shuttle enters orbit. Based on the trajectory of the shuttle, a TAL site is selected and the shuttle continues across the Atlantic Ocean. If the launch is aborted within 14 minutes of take off, RAF Fairford would be the site selected. "Although the shuttle has never had to use Fairford, the base must still train to receive the Shuttle," said Mr. John Summers, human space flight support training officer. "Our engineers have determined that the possibility of using the base exists and, regardless of how remote the possibility, base members have to be ready." Fairford's mission to recover the shuttle was tested Nov. 16 when members of the Air Force's space flight support staff stationed at Patrick Air Force Base, Fla., evaluated Airmen on their ability to respond. Even before the shuttle launches, ground support crews at Fairford are standing alert. If a launch abort is called, the shuttle could land within moments -- just 10 minutes from launch abort to landing. They know the special circumstances of dealing with the shuttle - from chemicals present to egress procedures. "NASA specializes in redundant communication," Mr. Summers said. "They are in constant contact with the shuttle so possible responders know what to expect and react accordingly." And react they did. Although a blue Air Force bus served as the shuttle for the exercise, to the Airmen responding, it was the real thing. Airmen in the air traffic control tower were in constant communication with NASA, while firefighters and medical technicians were evaluated on timely response and assessing medical conditions of each "crew member." 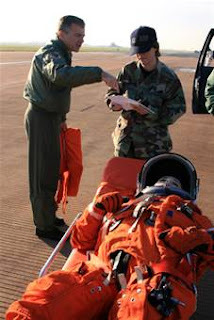 Aided by Lt. Col. (Dr.) Tom Hoffman, flight doctor assigned to the 45th Space Wing at Patrick AFB, each of the six "astronauts" suffered from a different problem - broken bones to smoke inhalation. The chemicals present on the space shuttle also pose a health risk. "Before responding the shuttle is monitored for chemical leakage so we know how to address the situation and how it affects the astronauts inside," Doctor Hoffman said. The exercise went beyond Fairford's perimeter fence all the way to the Kennedy Space Center in Florida, which is where Atlantis will launch. The word back from the center to the base flightline was one of success. "The people at Kennedy are very happy with Fairford," Mr. Summers said. Everyone from the tower controller to the on-scene commander acted very professionally." To Col. Joseph Dill, 420th Air Base Group commander, it was all in a day's work for Airmen at Fairford. "We have the longest runway in the [Unites States Air Forces in Europe] footprint and resources to support all [Department of Defense] assets," he said. "We practice this once a month, every month and our team is ready to respond." If Fairford is ever called upon to respond to an aborted landing, what happens in the first 24 hours is crucial, as the shuttle and its crew will depend wholly on the base for support. Some of this support will come from local nationals in the form emergency response and hospitalization. Because the base has limited assets, the base must rely on off-base agencies for help. "The working relationship we have with the surrounding community is outstanding," said Mr. Mark Webb, assistant fire chief. "We have been working on this scenario and we know what each person does." In the next few weeks, people from all over will be watching Kennedy Space Center and waiting for the confirmation of shuttle launch. But a small cadre of Airmen will be manning the radio "just in case."